With the door on the side, the 6 X 10 Peckover Shed certainly has a look that sets it apart from all the rest. This is a shed that offers a very large amount of storage space and when you walk into it for the first time, a huge smile is sure to appear as your mind races with all the things you can do with the space. 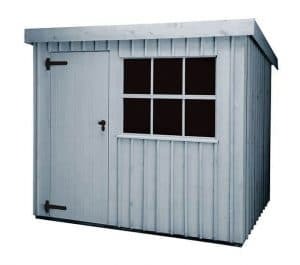 Despite the large size, the way the Peckover Shed is designed means that it can still be fitted into most gardens and offer you a vast amount of storage for a lot of years. The corrugated apex style roof along with that very classic sawn cladding and not to mention that fantastic Georgian window, are going to make sure that this is not just a shed that is here to look good, but also to protect your belongings from our harsh British weather. Made from the toughest Scandinavian Redwood this is so strong and well built that it will be the only shed you ever need. The Peckover Shed really does tick all the boxes when it comes to what makes a good, strong and long lasting shed. 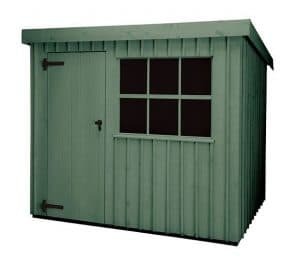 The Peckover Shed has a very interesting look to it that does make it seem just a little bit more different from the rest of the sheds that Crane offer, but still retains the classic charm this line is all about. Offering 9 feet 8 inches of length along with a respectable, 5 feet 9 inches of width, we do think that the amount of storage space you have here is ideal. 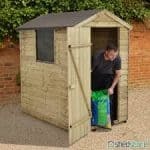 Because of the way the door is placed at one end of the shed it means that even though the shed has a near 10 foot length it can actually fit into even more compact gardens. The headroom offered by the Peckover Shed is very generous, with the ridge height being the better part of 7 feet high and even the lowest section of the shed coming in at a near 6 feet. We absolutely love an apex style roof as it is certainly eye catching, but it also has two major practical benefits in addition to being gorgeous. Firstly, it gives you a vast amount of head room right down the middle of the shed making walking around no problem at all. Secondly, it prevents rain from sitting on the roof and getting into the shed as it will always run right off. One of the first things you notice about the shed is that black corrugated roof sheeting which looks amazing and really does give the shed a high quality look. Using 16 x 125 mm roof boards made from Scandinavian Redwood underneath the corrugated roof sheeting makes sure that the roof stays put. Crane have really made great use of the Scandinavian Redwood all throughout the shed and that is evident right away with the sawn cladding. This cladding really does help give the shed such a special and interesting kind of look. And at 12 x 150 mm the cladding is not only there to make you smile when you look at the shed, but also to keep any rain that hits it outside. Just left like this we feel this cladding does offer a great look, but Crane have gone that extra little bit further by adding an extra topping of 16 x 38 mm to give the shed an extra bit of personality and really make it something that stands out in your garden. With being as attractive as it is, you could easily make the mistake of thinking that, the Peckover Shed is a weak and flimsy structure. Well that is not the case at all, as this shed is every bit as strong as it is good looking. This is all down to the frame which is 38 x 50 mm and made from that fantastically powerful Scandinavian Redwood. The joiners at Crane who designed the frame really did a great job in making it so this is a shed that is just incredibly stable and robust. Not only that, but this frame has been cleverly designed with the intention that it will stay strong for the whole life of the shed. In keeping with the high quality of the rest of the shed, Crane have made sure that the floor is going to be something that is not only hard-wearing, but still strong five, seven, ten or even more years down the line as well. The flooring is actually made from those exact same, 16 x 125 mm boards that are doing a great job holding up the roof. These are great boards and the amount of weight they can take is very impressive. 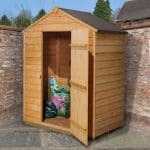 You can easily have your mower and all the gardening supplies, tools or whatever else you may need stored in here. Another aspect of the shed that we were very impressed with were the floor joists. These are laid out perfectly to really maximize their effect and at 19 x 50 mm they also offer a very good amount of extra support for the floor. 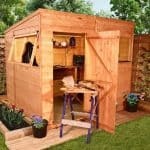 It is down to you to treat your Peckover Shed with wood treatment and we recommend doing this pretty much right away once the shed has been installed. This not only gives your shed the best possible start in its life and protection from the elements, but it also gets you into the habit of taking good care of your shed. A two year warranty is what Crane give you and that does cover your shed for repairs or replacements when it comes to general wear and tear. While you will have a spot in your garden picked out before the shed arrives, Crane will offer their advice if that spot is suitable for the shed to be built on. Choosing not to take their advice can possibly make your warranty invalid. The door that Crane have used is just as high quality as the rest of the shed. 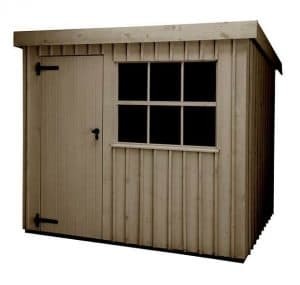 It is made from the same Scandinavian Redwood that the rest of the shed is and it is held in place by very reliable, strap hinges which along with the door handle and lock all are done in a nice dark black design to make them more noticeable. The door when opened gives you 710 mm in width and 1800 mm in height which we feel is a lot of room. In other words getting things in and out of here is not going to require a whole lot of twisting and turning. The door is located on the side of the shed which is a very interesting design choice and something we really like. This means that when you open the door you are greeted to that vast, near ten feet of length. When you first look at the windows you may take a second look as you realise that these are made from actual glass and not a cheap plastic substitute. This is no normal glass either as it is 4 mm thick and has gone through a toughening process to make sure it will last for many years. The window is set in a frame that has been designed and built by Crane’s in house expert joiners and it is something that you may not notice at first, but when you do it is impossible not be impressed with the craftsmanship. All of your belongings are going to be kept locked away safely thanks to the mortice lock that is on the door. This is a very good lock and along with those strong door hinges will make sure that the door stays securely locked up at night. You could easily add a bit extra security like a padlock if you want, but we feel the standard lock will be more than enough. With the door being on the side of the shed it is most likely that the window will not be facing a large open area of your garden, but if it is and you do have a concern over people being able to see inside, we think that a blind or perhaps a little curtain would be a great way to counteract this. The Peckover Shed can be painted in six different colours. Offering, Painters Grey, Earls Grey, Dome Ochre, Wades Lantern, Disraeli Green and Terrace Green. We are more than confident that there will be a colour to suit your taste. Crane really do not cut any corners with their sheds and that is the same with this one right here. It just has quality written all over it and you can tell this is made in the very best way the moment you see it. By selecting materials such as corrugated roof sheeting and Scandinavian Redwood, Crane have not only made a shed that looks great, but also made a shed that is going to last for years. We love how when you open the door you have this huge amount of space looking back at you. The size is very impressive and by adding a couple of shelves to the inside walls, you can make it so you can store even more items in here. There is no need to worry about cutting your finger with a saw or hitting your thumb with a hammer because Crane will build the shed for you. 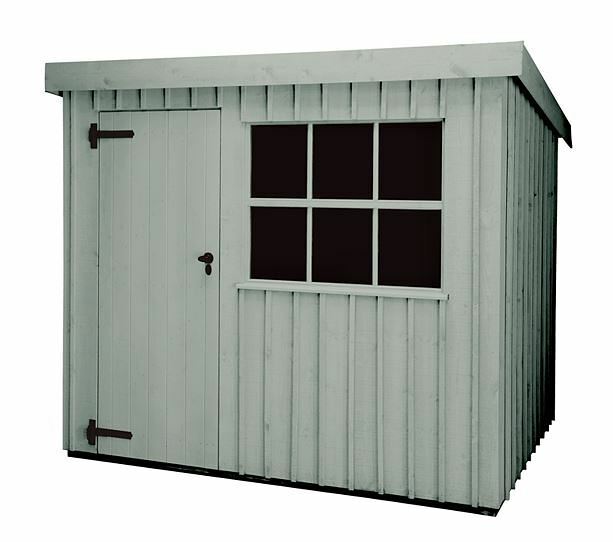 Peckover Shed is just under two thousand pounds and we think that makes it a very good deal. 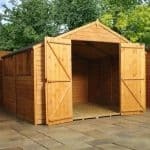 The space it offers and the masterful way it is built by Crane themselves really does make this a shed that we feel offers you good value for your money. Final Thoughts: We have no concerns at all about recommending the Peckover Shed. It is made from the most durable and long lasting materials, Crane will build it to ensure it is done right and it also looks great as well. It just offers everything that a person could want in a shed and it does it all at under two thousand pounds. 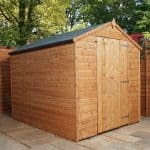 Getting a shed that is made from materials of this high quality, built to such a high standard and to actually do it all for this kind of money is not easy. 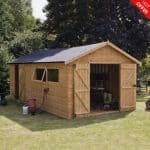 So with that in mind, we say if you are in the market for a high class shed then this is well worth having a very close look at.